Tabaluga is an incredibly popular German musical stage show for kids (and grown-ups). It was created by Peter Maffay in the 1980’s and has sold millions of CDs and DVDs. For the “2016 Tour” our client Häusler Arts convinced the showrunners to push the envelope and replace the old-fashioned stage with a huge LED screen (a whopping 32 x 10 meters!) 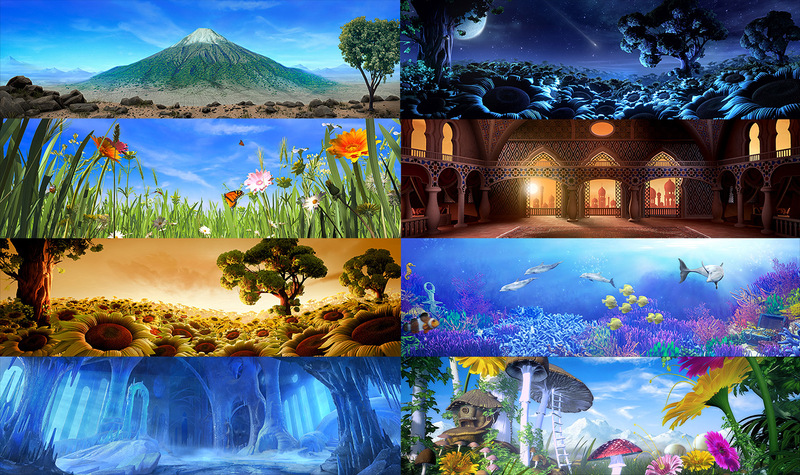 playing various animated 3D videos for its many musical numbers. We created over 30 animated clips for 14 different environments to be shown on the LED and a projection screen. The whole spectacle included the loveliest motives, animated shots from underwater worlds, sunflower fields, oriental palaces, fantasy landscapes, and as a final crescendo 20 minutes of an exploding volcano! With a show this big (over 100 actors and on stage musicians) and a super tight schedule we worked closely with the creative director. Based on initial moods we started by delivering concepts of every single scene and had our team build every shot with a whole arsenal of 3d soft- and hardware. The show wrapped in December 2016 after touring Germany and Switzerland for 3 months, with 64 shows in 19 cities, 2 shows each day, 3 days a week, to great comercial success: more than 390.000 spectators. Of course this wasn’t our achievement, but we like to think that our work was a worthy contribution!